October 31, 2018 – October 31, 2019 $17 w/cart -or- $11 walking Rates include green fee, tax and cart, unless walking; subject to availability. April 1, 2018 – October 28, 2019 $25 Monday-Friday; $35 weekends and holidays $30 After 11am on Weekends $20 After 3pm everyday $20 walking (anytime) November 19, 2019 – March 31, 2019 $35 Monday-Friday $40 before 11am & $35 after 11am, weekends and holidays $30 walking rate daily $15 9-hole walk $25 Twilight after 2pm Rates include green fee and cart; subject to sales tax. October 29, 2018 – December 15, 2018 $65 Monday-Friday $75 weekends and holidays $48 9-holes (weekdays only) $50 twilight (after noon) $50 walking daily rate $35 walking (after 2pm) December 16, 2018 – March 31, 2019 $65 Monday-Friday $90 weekends and holidays $55 9-holes (weekdays only) $60 twilight (after noon) $60 walking rate daily $45 walking (after 2pm) April 1, 2019 – April 29, 2019 $65 Monday-Friday $75 weekends and holidays $48 9-holes (weekdays only) $50 twilight (after noon) $50 walking rate daily $35 walking (after 2pm) April 30, 2019 – October 28, 2019 $39 Monday-Friday $50 weekends and holidays $28 9-holes (weekdays only) $39 twilight (after noon) $28 walking rate daily $28 walking (after 2pm) Guests of Patron Card Members qualify for South Florida rate; from November through April, forecaddie service is optional for Patron Card Members and may be added to a round for $26 per player, plus gratuity (recommended at $25 per player); Rates include green fee and cart; subject to availability. April 1, 2019 – October 31, 2019 $18 w/cart -or- $10 walking November 1, 2018 – March 31, 2019 $22 w/cart -or- $12 walking Rates include green fee, tax and cart, unless walking; subject to availability. November 1, 2018 – April 1, 2019 $35 Monday-Friday; $43 weekends and holidays April 1, 2019 – April 29, 2019 $35 Monday-Friday; $43 weekends and holidays April 30, 2019 – October 28, 2019 $28 Monday-Friday; $35 weekends and holidays Rates include green fee, tax and cart; subject to availability. Loyalty Points are awarded to rack-rate Patron Rounds only. Rounds with special rates and offers do not award Loyalty Points. 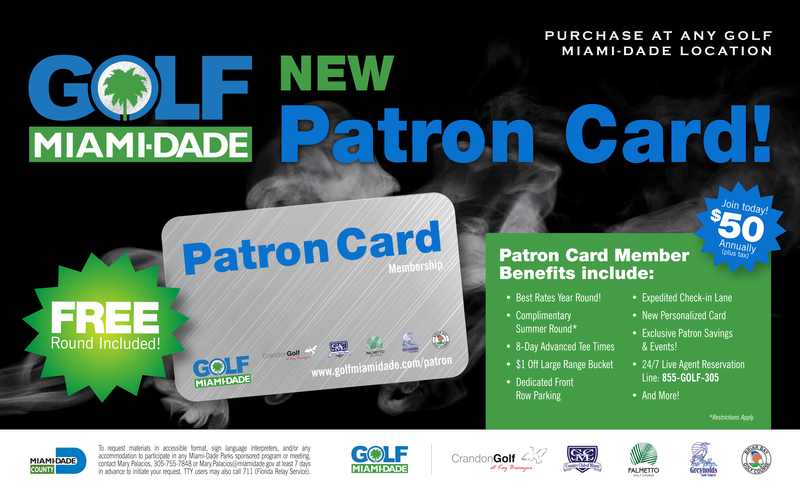 *Broward and Monroe county residents can purchase the Patron Card at Country Club of Miami for $89! (South Florida Residents are residents of Broward, Monroe, Palm Beach, Collier counties (excluding Miami-Dade County).